Nine hundred miles from home, these stylish sisters have turned their passion for high quality fashion into the most talked about 6-day shopping events in Lake Norman and Matthews. Baby sister, Dana is a mom of two littles and registered dietitian who loves to help anyone achieve optimal health! Cindy, a former corporate activity director and mom, enjoys teaching group fitness classes, healthy coaching, cooking and traveling with her husband and two boys. The one thing these sisters LOVE doing together is shopping, especially when there’s a SALE! 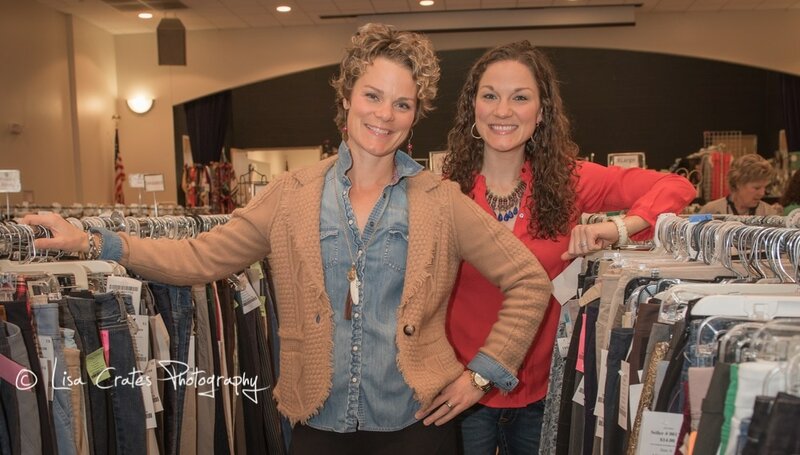 Green Jeans Consignment is the result of a consignment SALE the sisters shopped in their hometown, Milwaukee, WI. Each spring and fall, Cindy and Dana's 6-day shopping events attract over 600 consignors and thousands of shoppers. They are committed to selling only high quality, NEW and gently used clothing, shoes, handbags and accessories for women and teens of all sizes and ages. Their sales floor not only boasts fabulous fashion, but it is highly organized and easy to navigate, thanks to their AMAZING Mom, Rita, whom they fly in for each sale. Cindy and Dana swear they couldn't host a sale without her.